I have, for a very long time, wanted to go to Origins Game Fair in Columbus or GenCon in Indianapolis. Origins is the far easier one as it is only a couple hours away, and in theory, could make for a nice long day trip, or quick two-day trip. However, things never really worked out between work, money, and availability. I had given some thought of going this year (2018) as I didn’t have the kids that weekend (though I could easily trade if needed even if I did) and I was single, so no plans… until there were plans, my first date with a new lady in 8 years, but more on that in a bit. I saw a loose idea to go to Columbus early Saturday, be there in time for Columbus Pride Festival Parade (I’m an LGBTQIA+ Ally and figured as it is in the same area and the weather was nice, I may as well do them all at the same time… actually the board-gaming community as a whole seems generally very much an Ally, more so than other geek cultures, which is fairly accepting anyhow, a subject I’d be interested in exploring some day), then onto the convention center for Origins itself. Anyhow, those loose plans were shaken up by a date. And I was pretty excited about the date, as she was attractive, geeky and there were lots of shared interests in many ways… She was as close to my dream of a geeky gamer girl as I got in the last few dating attempts. And a gamer girl, especially one that is into gaming cons would probably be the ideal dream… Anyhow, I was a bit nervous as it would have been my first date with a new lady in a little over 8 years. As of the Friday night, things were on… then Saturday I got up, dicked around on the Internet, took a nap, and then got the message it was canceled, and suddenly the idea of Origins was back on. It was already a bit past the time I’d want to be in Columbus, and I still had to get ready, then drive two plus hours… but I figured this isn’t a chance I was about to pass up, and I gathered a few games to take with me to play, gathered some clothes and the like, and I took off to fulfil a longtime dream. And thus I arrived in Columbus, found a nice parking garage and made my way to the convention center. Plenty of Origins badges to help lead the way, though I did check with one of the badged people. 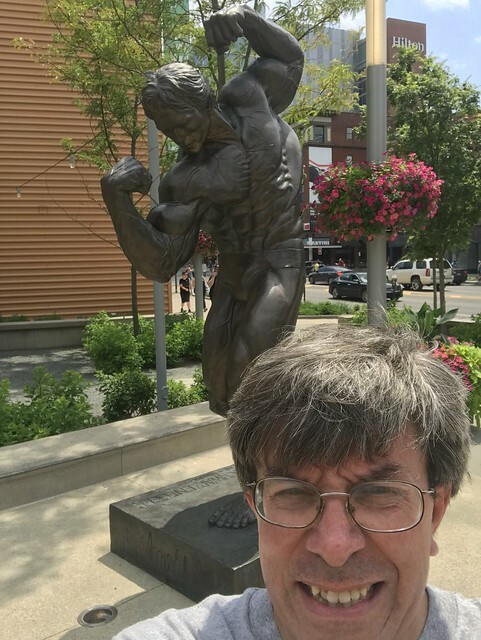 I, of course, had to take a selfie with the Arnold Schwarzenegger statue (I probably should have checked for Ingress or a Pokemon Go stop… or a Geocache… but I didn’t). A little side story about that group. They are a great group. Very nice and friendly, helpful and all that. However, the last time I went there, without my kids as a social shield of sorts, I had a panic attack due to social anxiety and haven’t been back since without the kids… and even with the kids we generally just stick to our own table and play games from the club’s library or what we bring. Anyhow, I do believe that club members get a discount on tickets that is even better than the pre-register price. 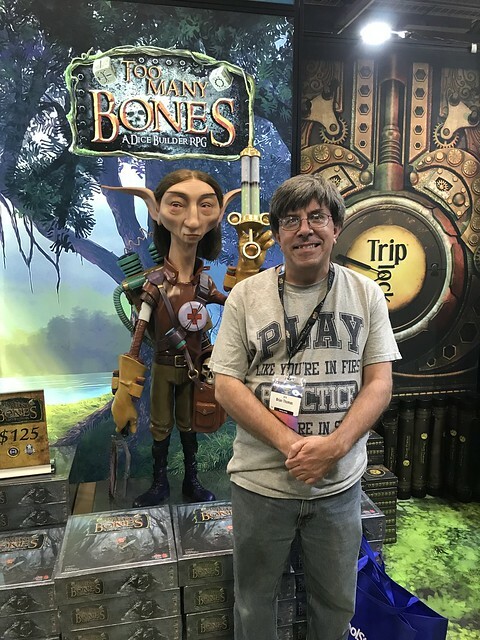 One of my favorite games is Too Many Bones Bones from Chip Theory Games, and there’s a new stand-alone expansion (can be played on its own or as an expansion to the original game) that is coming out very soon, and I was excited to see it in action. So the Chip Theory Games booth was my first, and probably most often made, stop (I probably should have got autographs either on my instruction manual or the 3rd edition box cover… I had it with me, I could have brought it in… but is that too geeky? getting an autograph from a board game designer for your favorite game? ), and I had to get a picture with Patches (who’s the character I first tried to use in my first two failed attempts at the game). I picked up two more characters for Too Many Bones, got a free dice mat and a pin during my last stop (I think) that day. 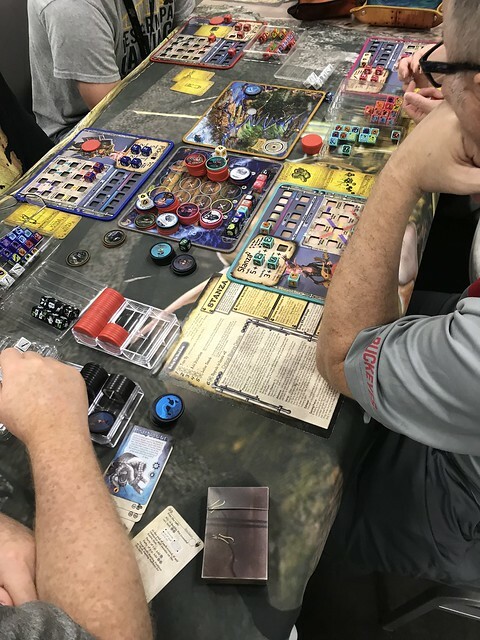 It was already a bit past the ideal time when I got to Columbus anyhow, but I did get around most of the convention center, watched lots of demos and had a good idea what I wanted to play the next day. Glad I got the two-day pass. So I booked myself a room at a hotel about 15 minutes up the freeway (for about a half to a third the price of the downtown hotels)… not the cleanest or most modern of hotels (70’s style carpet that looks like it was way past time for a steam cleaning… heck same for the room), but it was okay… the Wendy’s was a bit more disappointing (burger was dry for Wendy’s and the sweet tea was anything but… Like Leo Getz says “they screw you at the drive through” except he didn’t say screw…). Anyhow, I figured time to break out my favorite board game, now with one of the new characters and hope I had better luck. I did. I squeaked by with two or three health left. It looks like everything I had hoped from Undertow and more. So I for one can’t wait to get it added to my collection. 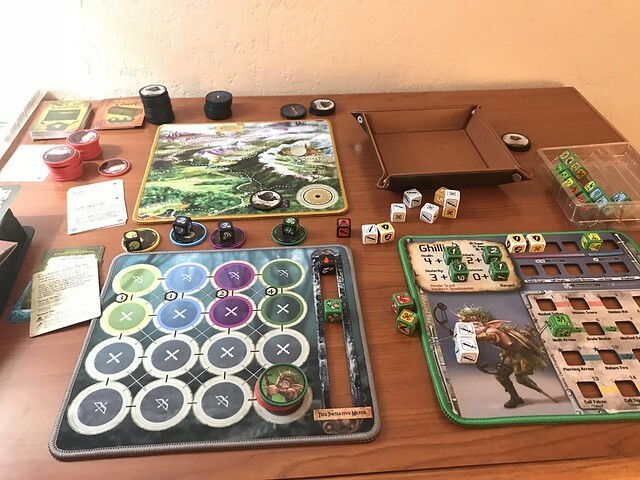 I could have pre-ordered it at Origins, but I was trying not to overspend, especially as the whole thing was last minute and not properly saved for. 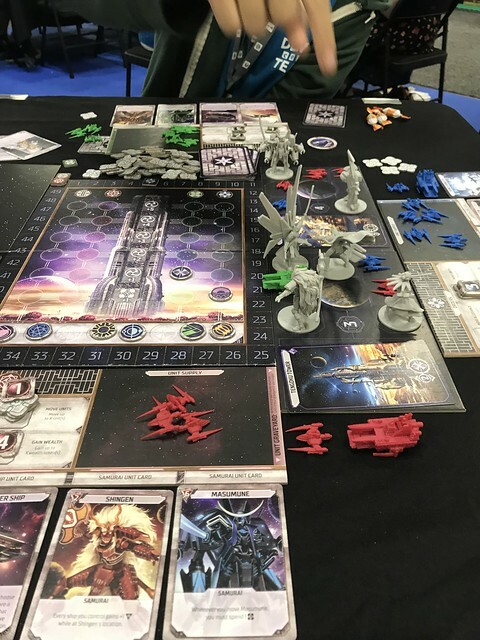 Then it was onto another demo or two, but the one that I ended up far more excited about than I was going into the convention was Starship Samurai from Plaid Hat Games, one of my top two or three game publishers… up there anyhow. I was just meh about the game before, but after playing the demo it shot up to the game of the con for me. Don’t get me wrong, I’d still prefer Undertow as I prefer co-operative and soloable games, but make no mistake, this had some seriously cool mechanics, figures and other stuff going on. 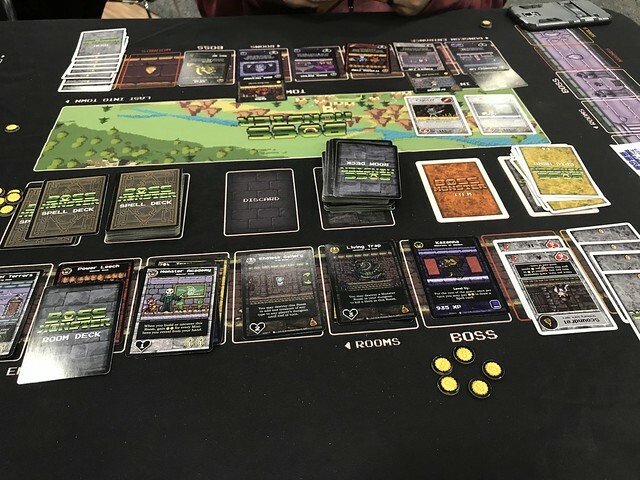 I got to try the new Boss Monster stand-alone expansion Boss Monster: Rise of the Mini-Bosses, which should be out next month (as I write this in June 2018), and I have to say, that I think it makes a near-ideal entry point to the series if you don’t have the game already… I don’t have it and only played it once before this demo. However, I think this is the point where I may finally have to jump on in. Plus I think the boys enjoyed the original base game when we tried it. I didn’t get to try Bunny Kingdom by IELLO. I didn’t do the paint and take the mini-figure painting. I didn’t make it to the Stronghold Games booth (although it was one of the areas that had the best connection to the free wi-fi without having to exit the exhibit hall, so I went by it a lot, lol). Those are a few of the booths and demos I didn’t get around to… and I had more time Sunday, but I was wanting to get back home, so I called it quits. Overall, I had a really good time and probably would have had a better time had it not been such a last-second thing. IF I do it again next year (I might aim for every other year), it certainly would be better planned. Unlike GenCon, it is close enough to make sense to plan on it. I’d also have to give serious consideration for volunteering at one of the booths… some of them even pay your passes if you do enough volunteer time… of course, you still have to come up with enough for that many days at a hotel… and I’m not sure how much free time you get to check out things yourself then… but it’s something I’d have to give serious consideration to, just would have to pick for whom, lol. As I was saying though, it was a good time and I’m glad I had a chance to go… now just to have that gamer girl who’d go with… or at least a lady who’d game with me sometimes and perhaps do a day or two at it, while she mostly did her own thing in town. But I digress again… the point was that it was a really good time. EDIT: To add, I think, if I had two full days, or better yet three full days if I got to do some gaming in the hall after, or in the hotels with others, then it would have even been better.